A new drug could ease the distress of men and women who suffer from baldness, according to researchers from The University of Manchester's Centre for Dermatology Research. However, it often has severe side-effects, the least serious - but most interesting - of which is that it enhances cosmetically unwanted hair growth. The inhibitory mechanism is completely unrelated to CsA's immunosuppressive activities, making SFRP1 a new and highly promising therapeutic target for anti-hair loss strategies. Dr Hawkshaw said: "Thanks to our collaboration with a local hair transplant surgeon, Dr Asim Shahmalak, we were able to conduct our experiments with scalp hair follicles that had generously been donated by over 40 patients and were then tested in organ cultures. "This makes our research clinically very relevant, as many hair research studies only use cell culture." He added: "When the hair growth-promoting effects of CsA were previously studied in mice, a very different molecular mechanism of action was suggested; had we relied on these mouse research concepts, we would have been barking up the wrong tree. 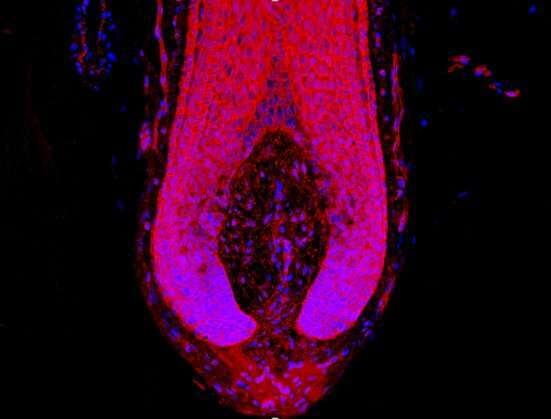 "The fact this new agent, which had never even been considered in a hair loss context, promotes human hair growth is exciting because of its translational potential: it could one day make a real difference to people who suffer from hair loss. "Clearly though, a clinical trial is required next to tell us whether this drug or similar compounds are both effective and safe in hair loss patients." Will baldness be worth the RISK of the unknown unknown? I would first test it in animals.